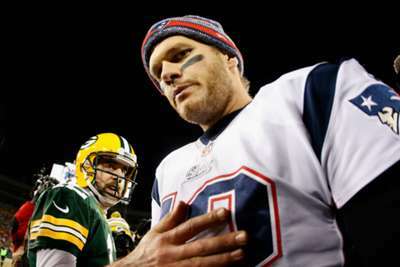 Tom Brady and Aaron Rodgers will go head to head for only the second and probably last time on Sunday as the Green Bay Packers visit the New England Patriots. Rodgers won the only meeting between the pair in 2014, however, while they are considered the greatest quarterbacks of the modern age and each guaranteed Hall of Famers, the Packers star has only been able to climb the mountain and win the Super Bowl once. Brady, meanwhile, has five Super Bowl rings in his collection. Rodgers lifted a Packers side that entered the playoffs as the NFC's sixth seed to Super Bowl glory in the 2010 campaign and his postseason appearances have followed the theme of him trying to elevate a team ill-prepared to contend at that level. Only in 2014, when an NFC Championship game collapse against the Seattle Seahawks prevented the Packers from booking a Super Bowl matchup with Brady and the Patriots, have Green Bay had a team capable of being considered genuine contenders. In most other years the Packers have had to deal with injury-riddled receiving corps, a lack of options at running back and tight end and sub-par defenses that have often undermined Rodgers' Herculean efforts on the other side of the ball. The numbers, provided by Opta, help illustrate the impact Brady's history of superior supporting casts. The yards per game difference (Brady 261.9, Rodgers 261.4) is negligible, but Rodgers has edge in completion percentage (64.9 to 64) and touchdowns per game (2.1 to 1.9). Brady has also thrown more interceptions per game (0.6 to 0.5), though not by much. In the playoffs Rodgers has the same advantage in TDs and is superior in terms of completion percentage (63.5 to 62.8) and interceptions per game (Brady 0.8, Rodgers 0.6). Additionally, Rodgers has 54 300+ yard passing games – 34.6 per cent of his regular-season games. Brady has 85 games with 300+ yards – 32.6 per cent of his regular-season games. Brady has thrown multiple touchdown passes in 162 games, 61.8 per cent of his games. Rodgers has done so in 64.7 per cent of his starts, 101 times. Despite Rodgers' numerical superiority almost across the board, it is Brady who continues to be more successful. He has a win percentage of 86 in his games with multiple touchdown passes, whereas Rodgers's is 76.2. Rodgers has had a larger percentage of 1,000-yard receivers in a shorter amount of time in the league. Since Brady became New England's regular starting quarterback in 2001, 16 players have had 1,000+ yard seasons (though two came in 2008, when Brady missed the majority of the season due to injury), with Welker having the most (5). Rodgers has 10 receivers with 1,000+ yard seasons since 2008, Jordy Nelson having four of those. However, the Packers have had just one receiver top 1,000 yards in a season since 2015 (Nelson in 2016), while the Patriots have had four in that time. That speaks to a decline in Rodgers' supporting cast in recent years, but he may actually have the edge in Sunday's encounter. Aaron Jones and Jamaal Williams provide him with a capable running attack, Davante Adams is a legitimate number one receiver while Geronimo Allison, Marquez Valdes-Scantling and Equanimeous St. Brown are developing into reliable depth options. At tight end, Jimmy Graham provides an elite option who has the potential to make a huge impact in the red zone. Brady, meanwhile, still has a favourite target in Julian Edelman but Gronkowski has consistently battled injuries and Josh Gordon does not appear fully fit. The pass-catching options beyond that trio are varying shades of average and, though James White is an excellent receiving running back, an injury to rookie Sony Michel has left New England having to rely on a career journeyman in Kenjon Barner alongside him.